With over 60 certificate, diploma and degree programs, Selkirk offers a variety of options for students just starting their post-secondary journey or returning as a mature student. Complete your credential at Selkirk College or transfer your credits towards furthering your education. Offering nationally recognized programs for over 45 years, Selkirk provides a variety of learning experiences both within and outside of classes. Many of Selkirk's programs have practicums, work terms, apprenticeships or co-op education options. 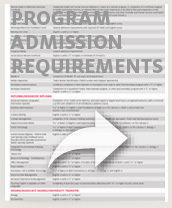 View Academic Program Chart (pdf).